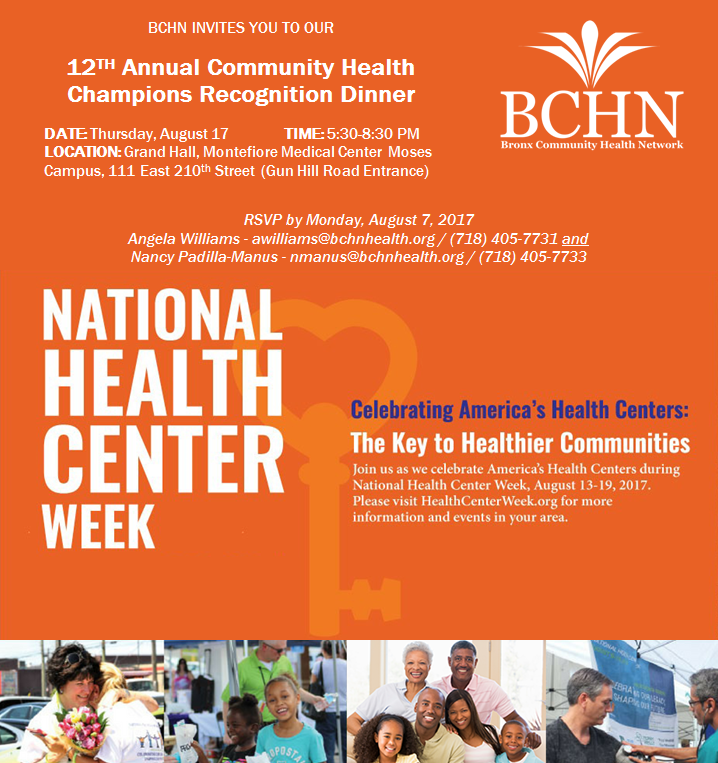 In celebration of National Health Center Week, Bronx Community Health Network (BCHN) will bring together health champions for the 12th Annual Community Health Champions Recognition Dinner on Thursday, August 17 from 5:30-8:30 PM. The ceremony will be hosted by television producer, actor and host Rhina Valentin. For the eighth straight year, the Robert Wood Johnson Foundation ranked the Bronx the unhealthiest county (62 out of 62) in New York State; nevertheless, there are signs that the Bronx is finally improving. In keeping with National Health Center Week’s (NHCW) theme this year, Celebrating America’s Health Centers: The Key to Healthier Communities, BCHN is celebrating the accomplishments of patient health champions at the health centers in its network. Awards will also be presented to partners, health leaders, and for community service. As local community owned and operated businesses, community health centers serve over 25 million Americans at more than 9,000 delivery sites in all 50 states, the District of Columbia, Puerto Rico and U.S. territories. Bronx Community Health Network (BCHN) is a non-profit Federally Funded Health Center that sponsors 18 community- and school-based health centers, owned and operated by Montefiore Medical Center and the Acacia Network. Serving more than 100,000 individuals from the Bronx each year, BCHN health centers offer Bronx residents affordable, quality medical care and related health services regardless of immigration status, race/ethnicity, sexual orientation, age, or ability to pay. Through its centers, individuals have access to comprehensive patient-centered care, including support services such as social workers, health educators, and nutritionists. Through its community based programs, BCHN promotes healthy lifestyles through health-related events; and links and refers community members to health care and other social support services. To find out more, visit bchnhealth.org.